"Let It Ride!" is a common cry at racecourses across the US. Essentially, it's an accumulator, or parlay bet, where the gambler lets his winnings carry forward to the next race. The method is also the main feature in the casino game, Let It Ride. Also known as Let 'Em Ride or Poker Ride, Let It Ride works a little like Texas Hold'em: the player is dealt three cards face up, and two 'community cards' are dealt face down. The aim is to bet on each stage, or 'street', of the hand, improving your hand as you go. Beat the dealer's poker hand and you'll scoop a win. To the uninitiated, the nuances of Let It Ride can be a little confusing. Luckily, most online casinos offer free-play games to get you started. 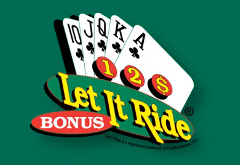 Like many online games, the first Let It Ride games appeared under the Bally/Shufflemaster banner. However, the game was popular in US casinos long before the Internet took over. The game has lost its appeal in recent years due to a relatively unfavourable house edge of around 3.51%. But the draw of Casino Hold'em, Caribbean Stud and Three-Card Poker has led to a resurgence. Let It Ride is a variant of Stud or Hold'em. Players are dealt three cards face up and two cards are dealt to the board. These down-cards act as 'community' cards and are shared by both the player and dealer. The aim of the game is to finish with the best five-card poker hand possible. You will be paid out according to the strength of your hand. Ante: The initial bet is called the 'ante'. This is placed in the spot clearly marked 'Ante'. Your three up-cards will be dealt, plus the two face-down community cards. Raise 1: Now you have to make a decision on whether to continue. You can 'cruise' to the next round, which is progressing without making a raise. You can also make a raise (equal to your ante) by placing another chip in the 'Raise' area. Raise 2: The first down card will be flipped over. You add this to your three cards, and make another decision - to call or raise. The second down-card is flipped over and you can complete your five-card hand. You will now be paid out according to the strength of your hand. The minimum qualifying hand is a pair of 10s, and pays even-money (1-1). Side bet: There is also a side bet option in some variants of Let It Ride. These side bets give you a chance of winning the progressive jackpot if you hit a Royal Flush. Typically, a Straight Flush will award the player 10% of the progressive prizepool. You sit down at a Let It Ride table. The ante is £1 minimum. Fourth Card: You don't like the look of your hand, so you click on the 'Continue' button to see what the first down card brings. The fourth card comes the Ah which doesn't improve your hand much. Fifth Card: You decide to continue again, not making a raise. The final down card is flipped over, to reveal the Js. Your pair of jacks qualifies and wins you £2 (£1 plus your original £1 stake). Deal: You bet £5 to start the hand. You are dealt 10d Kd Ad, giving you the chance to hit a pair of kings, a pair of aces, a flush, straight, or Royal Flush. Fourth card: You decide to raise this time, and a further £5 is placed on the first 'Raise' spot. The 5d is dealt out, giving you a flush draw. Fifth card: You opt to raise once again, and place another £5 on the second Raise spot. The final card comes the As. You have missed your flush but you've hit a pair of aces, winning 1/1 on each of your ante and raise bets. As in poker, picking the right hands to raise with is vital. If you get dealt a pair of tens, obviously two raises is the way to go, as you'll pick up even-money wins for each bet. You can find many 'three-card' strategies online, but generally you should 'let it ride' with a pair of 10s or higher, three of a kind, a 3-card straight flush, or a 3-card Royal Flush. Suited "gappers" like J-9-8, 10-9-7 and 10-8-7 are good too. There's no point chasing unlikely hands when you have four cards showing. Once you get to the fourth card you should already have a winner. But you should also have some value when trying to form a better hand. Open-ended straights, four-to-a-flush, a pair of 10s or better, and two-pair are solid 4-card hands with which to proceed to a fifth card. Most online casinos operate a form of Let It Ride where additional bets are made depending on your hand. However, in the classic version, players make ALL raise bets BEFORE the hand starts. They then have the option to remove bets from the table or stick with their wager after each card is drawn. Give a few casinos a try before you settle on a variant of the game you enjoy.